When looking at entry level Nespresso machines, the Inissia and the Essenza Mini in this case, it can be hard to tell differences between each model aside from the ways that they are designed and look. I can assure you however that there are actual “under-the-hood” differences between each machine and there are reasons to buy one unit over the other. In today’s article, I am going to compare the older Nespresso Inissia Espresso Machine by De’Longhi to the newer Essenza Mini Espresso Machine by Breville – I am also going to take a look at which model might be a better choice for you depending on your personal preferences. BTW, there is also an Essenza Mini made by De’Longhi which functions exactly the same as the Breville version, the difference is that it is styled a bit more and costs a bit less. See here to check it’s price, it’s usually less. In past articles we have fully reviewed each of these units but a side-by-side comparison is extremely helpful because both Nespresso machines (the Inissia and the Essenza Mini) are so closely priced and their functions are so similar. I brewed approximately 50-100 Nespresso capsules from each of these machines over the first few months of 2018 and now I’ve got a lot to say about them. They are very different units after you use them both long enough. UPDATE – The Inissia is actually a discontinued model now. Nespresso stopped producing it in 2018 and now it can usually be only found in used condition… although there are some sellers unloading new units for cheap as retailers liquidate inventory. Before I really get to the meat of the post however I want to sum it up right here for readers who need a nudge one way or the other. If I were to buy one over the other I would probably buy the Essenza Mini. It is priced low, it’s about 10 decibels quieter (I’ve tested this with my own meter), it’s easier to open and close the capsule slot, and the water reservoir (although smaller) is easier for me to refill… although I can’t tell you why. I’ve done it enough on both machines that I just feel it. Want to read a full review? Click through to see our Essenza mini review or our Inissia review. So with that said up front, let us get started on the rest of the comparison without further delay! The Nespresso Inissia: What are the Main Features? The Nespresso Inissia Espresso Machine is a great model from the De’Longhi line of products (there is also a version from Breville which is basically identical too). 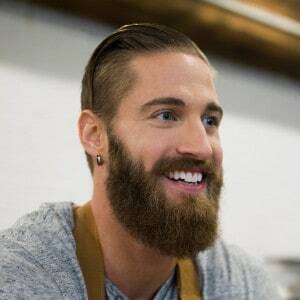 For those of you who do not know, this is one of the line of products that is really loved in the market and has a lot of bestselling products- and most of the models from this line of products are really worth it. One of the things this model sure does boast of is the right size. It is just the right size to put up anywhere and wherever you want to put it up. Unlike the De’Longhi Nespresso Expert Espresso Machine (Click here to read my review of the De’Longhi Nespresso Expert Espresso Machine) which is too large to properly put on many countertops, this model is actually the right size. This model has a 24 ounce capacity (0.7 L), which is fairly the average size. However, this machine can heat up really fast, within 25 seconds, and at the touch of a button! If even that were not enough for you, this machine also boasts of an adjustable cup size and gives you two adjustable buttons, the Espresso and Lungo, to choose from as you wish! The folding drip tray that this machine has is also really great! It properly lets you place larger cups and automatically drops when you remove your mug so that nothing is spilled. 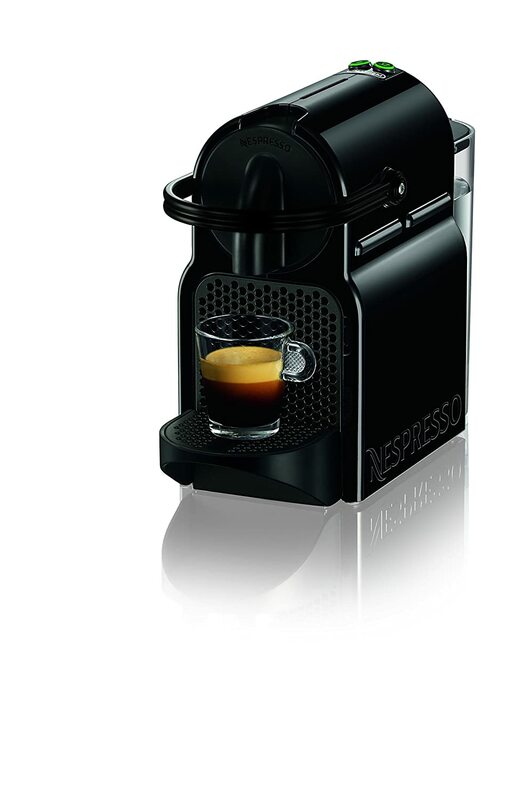 This model is also one of the most affordable models in the entire Nespresso Series. While it might not specifically be the most affordable one, it sure is really affordable and most of the people can go for it even if they are on a tight budget. 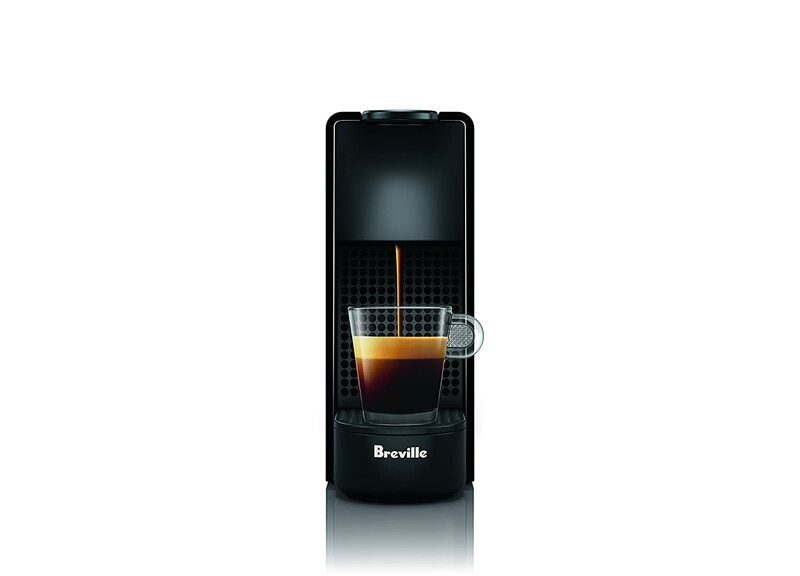 What are the Main Features of the Breville Nespresso Essenza Mini? The Essenza Mini Espresso Machine by Breville, as the name makes clear, is a model from the Breville line of products. The Breville line of products has a lot of dedicated customers because of the amount of functionality that they provide you with. Most of the products cost a little more than the other similar models in the market, but are usually worth it because of their extra functionality level. The Breville Nespresso Essenza Mini is yet another product that provides you with two options to choose from: Espresso and Lunge. This machine also has a water tank capacity of 0.6 litres. Besides this, this model also boasts of the special Centrifusion technology like the Breville Vertuo, that ensures that you get the maximum aroma and flavor from your capsules! This model also boasts of one more thing, Energy-saving! The Eco mode kicks in for low Energy consumption after 3 minutes and an automatic energy-saving function switches machine off after 9 minutes of inactivity. Finally, while not the cheapest model available out there, this model is still one of the most affordable models that are available from the Breville line of products. The first difference is in the tank size. The Inissia has a tank size of 0.7 Litres while the Essenza has one of about 0.6 liters. This is a really minor difference and doesn’t really mean much unless you need the slightly larger (or smaller) one for something more specific. The next thing to keep in mind is that the Essenza Mini uses the Centrifusion technology that provides you with the perfect flavor and aroma. This is absent when it comes to the Inissia. Then comes to eco-mode. The Breville Essenza Mini boasts of a special eco-mode that kicks in after 3 minutes to save you some extra electricity. However, you might want to keep in mind that both the models switch off after 9 minutes. The Nespresso Inissia also boasts of a special fold-able drip tray, which is one of the special things about this model. The Nespresso Essenza doesn’t provide you with this special drip tray. Verdict: Equal. Both the models have their own ups and downs, but given the same price and the same overall features, I would say that these two models are equally nice. You might still want to judge them according to your needs and buy the one that you personally like! Choosing the right model is something a lot of customers seem to struggle with. However, that is simply because they are just unaware of how they might be able to understand which model is the right one for them. Having experience using them both I would tend to advise people to go for the Essenza over the Innisia though because it is a bit less loud. The first thing to do in this regard is that you must know your own needs. Once you know your needs, you can judge every model based on that and find the one that serves all your needs in the way you desire. This is the only way to find the perfect model for yourself. As we always say, the right model for you is not the bestselling model out there but the one that serves all your needs at the most affordable price. At the end of the day, you must know that Gamble Bay Coffee is always here for you. We here try to bring to you the perfect comparisons to help you choose the right model for yourself. If you have any queries, feel free to reach out to us because we are here only for you! We would try out best to help you out in any way possible. Also, please do not forget to reach out to us if you think that we should add or talk about something that we might have missed! We look forward to hearing from you! Finally, we hope you learned something new from this article and would check out our other articles. Looking forward to having you again, good day! ← How Big is a Coffee Scoop? Is it Bigger or Smaller Than a Tablespoon?